The holiday shopping season is now underway. According to the Wall Street Journal, consumers spent about $10.66 billion on Black Friday, a smidgen higher than last year. And what does that portend for the holiday season and the economy overall? Short answer: No one knows. As Karen Dynan notes in today’s Washington Post, the link between Black Friday sales and holiday sales isn’t as tight as many people think. And the link between holiday sales and the overall economy is even weaker. Those are two of the “5 Myths about Holiday Spending Sprees” that Karen identifies. As the New York Times noted a few days ago, cupcakes are hot. I’ve seen shops sprouting around the DC area, and according to the article we are not alone: New York, Los Angeles, Denver, and other cities are also enjoying cupcake boomlets. I must admit that I don’t know what’s driving the rise of the cupcake. Did Americans finally realize that Krispy Kreme doughnuts are over-rated at best (one man’s opinion)? Was there a technological breakthrough in cupcake production? Has the weak economy lowered rents and labor costs so much that cupcakery is now economically viable? What I can tell you is that the new cupcake entrepreneurs have a tough road ahead of them. Competition is heating up–good news for cupcake consumers, but bad news for entrepreneurs. For each cupcake she sells, Ms. Lovely figures she spends 60 cents on ingredients, 57 cents on mortgage payments and utilities, 48 cents on labor, 18 cents on packaging and merchant fees, 16 cents on loan repayment, 24 cents for marketing, 18 cents for miscellaneous expenses and 4 cents for insurance. That totals $2.45, leaving a potential profit of 55 cents on each $3 cupcake. So far, the per-cupcake margin is going to pay down start-up expenses. She’s been selling the 2,800 cupcakes a month she calculates she needs to sell to cover her costs — she’s taking only a small salary for now — but she says it’s too early to predict when the store will turn profitable, in part because of the economy and in part because she fears losing business to rival cupcake entrepreneurs. Ms. Lovely is in the process of rebranding the shop to overcome what she calls “a typical rookie mistake” of underestimating “the power and importance of branding and marketing.” She said she had to do more to tell customers that her cupcakes were made from organic, local and natural ingredients. Rivals will eat into your profits. If cupcakes are a good idea, other bakers will follow. To have any chance of making profits in the long run, you’ve got to differentiate yourself. Build a brand and maybe, just maybe, customers will keep coming despite all your rivals. 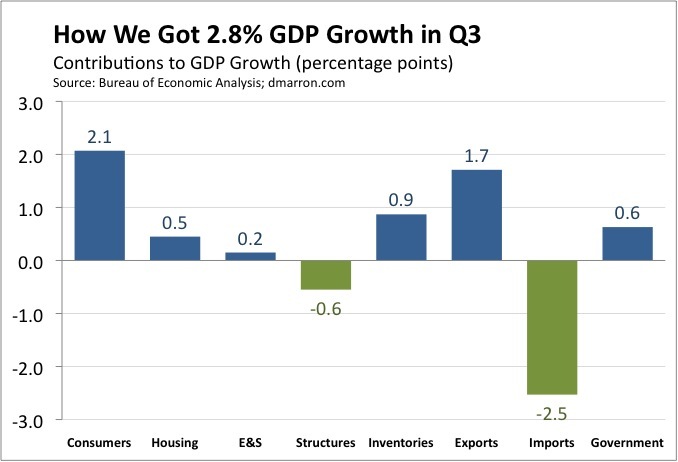 As expected, the Bureau of Economic Analysis revised down its estimate of Q3 GDP growth. BEA’s second estimate pegs growth at a 2.8% annual pace in Q3, down from 3.5% in the advance estimate. The revision was driven by three main factors: consumer spending and business investment in structures were weaker than previously estimated, while imports were stronger. In principle, the solid growth in consumer spending and housing investment should be promising signs, given their previous weakness. However, both were boosted by temporary stimulus efforts. Cash-for-clunkers lifted consumer auto sales in Q3, for example, but we should expect some payback in Q4. Meanwhile, the tax credit for new home buyers helped housing investment record its first increase since late 2005, but some of that may have come at the expense of future housing investment (because potential home owners accelerated purchases when they thought the credit was going to expire; it’s since been extended and broadened). Note: If the idea of contributions to GDP growth is new to you, here’s a quick primer on how to understand these figures. 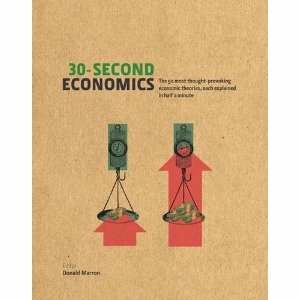 Consumer spending makes up about 70% of the economy. Consumer spending rose at a 2.9% pace in the third quarter. Putting those figures together, we say that consumer spending contributed about 2.1 percentage points (70% x 2.9%, allowing for some rounding) to third quarter growth. My existential crisis is over. As of last Thursday, Google is again including this blog in its search results. So, welcome to all the new readers who’ve come here after Googling information on the Eggo shortage and the debate about whether kids should get one H1N1 shot or two. This is probably of interest only to other bloggers, but for the record: When I first started this blog, it took about six weeks for it to appear regularly in Google search results. After several months, the blog inexplicably (to me, at least) disappeared from Google’s results. As in *really* disappeared; as one friend pointed out, you couldn’t even find it if you searched for “Donald Marron blog”. About eight weeks elapsed before it reappeared regularly in the first few pages of Google’s results. My eight-week exile provided a nice natural experiment for evaluating Google’s importance. Not surprisingly, Google drives a good amount of traffic; readership is larger when Google knows about the blog. The more interesting impact, though, is a version of the Long Tail: with Google’s help, more posts find readers on any given day. When I was reading newspapers this morning (yes, I still get ink on dead trees), I noticed several claims that this difference in gross costs could be traced to a timing difference. The main coverage provisions in the House bill start in 2013, while the corresponding provisions in the Senate bill start in 2014. 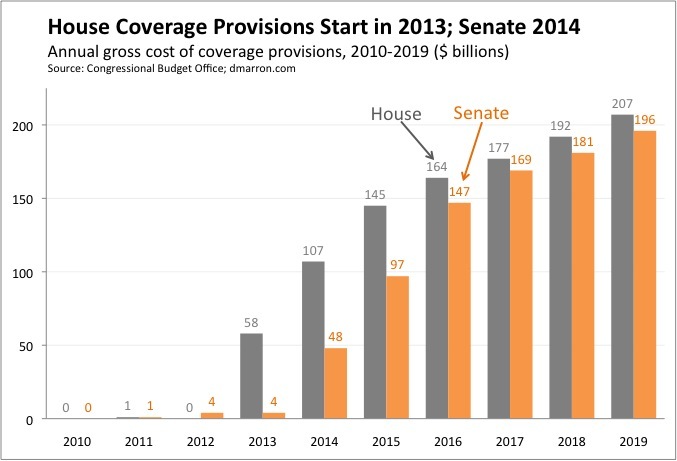 The coverage costs in the House bill (denoted in gray) do indeed ramp up a year earlier than the costs in the Senate bill (denoted in orange). As a result, the ten-year cost estimates include seven years of coverage efforts under the House bill, but only six years under the Senate bill. That timing difference accounts for almost all of the gap between the $848 billion gross coverage cost of the Senate bill and the $1.052 trillion of the House bill. (One way to see this is to note that the seventh year of the House bill costs about $200 billion, almost exactly equal to the difference in the ten-year cost estimates). Bottom line: Over the ten-year window, the gross coverage costs of the two bills appear quite different, with the Senate bill coming in about 20% lower than the House bill. But much of that difference is timing. Over longer time periods, the gross coverage costs are much closer together. How Much Does the Senate Health Bill Cost? 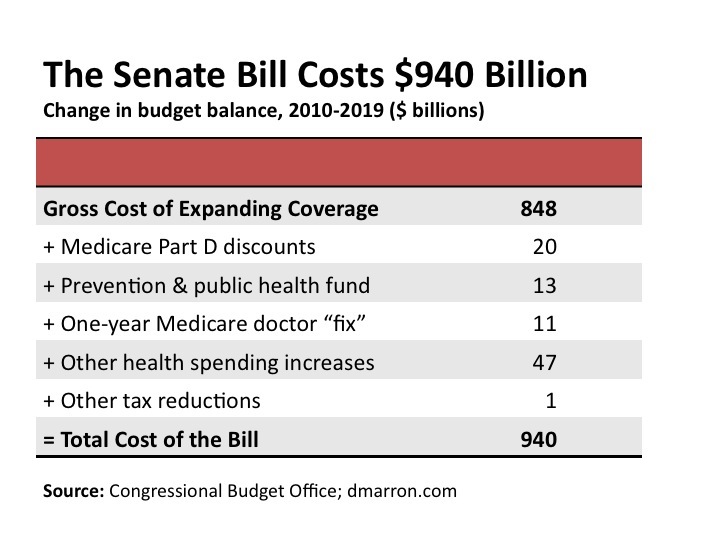 Everyone following this debate should keep in mind, however, that even the gross coverage figures do not capture all the costs of these bills. As I’ve pointed out several times (e.g., here and here), the health bills include many important provisions in addition to those expanding coverage. Many of those non-coverage provisions are intended to save money and thus pay for the coverage expansions. 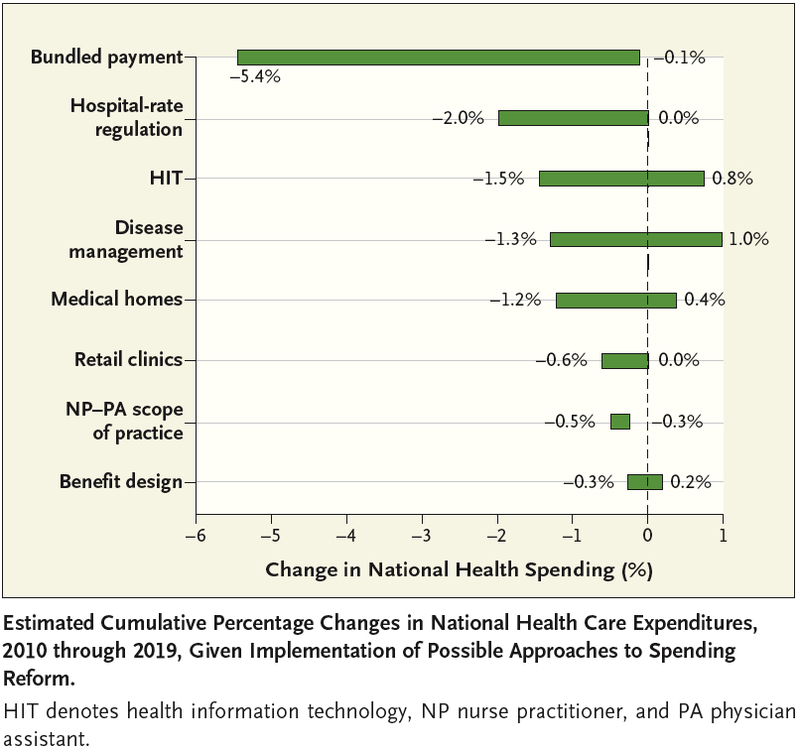 But some of the provisions expand spending on other health programs. Caveats: CBO does not calculate a total cost figure for the health bills. The bills include dozens of policy changes, and it would be difficult (perhaps impossible) to allocate all their impacts to specific provisions. Thus, my figures should be considered approximate. I calculated the $90 billion figure for additional spending by adding up all the individual line items in Table 4 of the cost estimate that increased direct spending, with a couple of exceptions. First, I did not include the interaction effects that CBO lists as the end of the estimate because I was not sure how to allocate them; the interactions are large and could have a material effect on my estimate, potentially up or down. Second, there was one policy that led to both spending increases and spending decreases; I included the net spending increase in my figure. I am certainly open to other suggestions about how to add up the other spending in the bill. It’s also worth noting that I have taken as given CBO’s estimate of the gross cost of expanding coverage. There are some nuances in the calculation of that figure (e.g., the treatment of payments in a reinsurance program) that I need to understand better.